cryptonaut-in-exile: Louisiana man's deer stand camera captures mysterious "human-like" figure. Louisiana man's deer stand camera captures mysterious "human-like" figure. 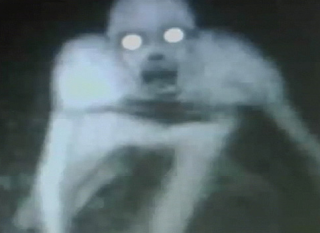 The viewer who turned in this picture claims his friend found the freaky photo on his deer stand camera. He says the hunting cam was broken, but the SIM card was still there and so was this crazy image. The viewer claims this is NOT a hoax. Pro-tip: 100% of all successful hoaxes were not presented by their perpetrators as being, in fact, hoaxes.